The status of Americans’ social ties and the vigor of their communities have drawn considerable attention in recent years, much of it focused on the degree to which the internet, cell phones, and other information and communication devices are affecting Americans’ social lives. To assess the state of the play in these social arenas, the Pew Research Center’s Internet & American Life Project did a national phone survey of 2,303 adults between November 23 and December 21, 2010. 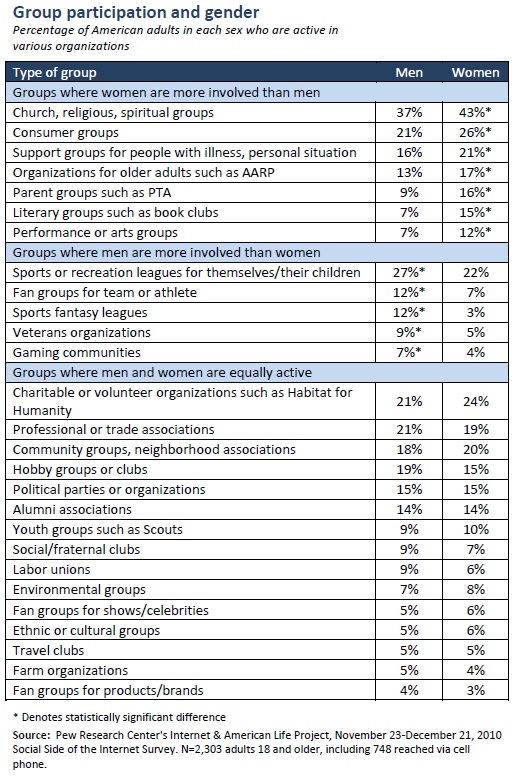 All told, 75% of Americans are active in one kind of group or another. Internet and cell phone owners are more likely than non-technology users to be active in groups. Fully 80% of internet users are active in one kind of group or another, compared with 56% of non-internet users; and 86% of cell owners are active in a group, compared with 62% of non-cell owners. Furthermore, those who are active in social media are among the most heavily involved group participants: 82% of those who use social networking sites such as Facebook say they are active in groups vs. 77% of the internet users who are not users of such sites; and 85% of Twitter users are active in groups vs. 79% of the online Americans who are not Twitter users. These figures about group participants come from those who said they belonged to at least one of 27 different kinds of groups that we queried in the survey. If a person said “yes” to being active in at least one group, then she was counted among the 75% of Americans who are active in groups. In fact, the average American adult is active in 3.51 groups of the various types we queried. Some 14% of adults belong to at least 8 types of groups. In addition, the average person spends 6.54 hours per week in group activities. In a notable number of cases, demography is destiny when it comes to group participation in America. There is considerable variance in group membership depending on gender, age, racial and ethnic groups, and socio-economic status. For instance, women are more likely than men to be active in church groups, consumer groups, support groups, parent groups, literacy groups and performance groups among other things. 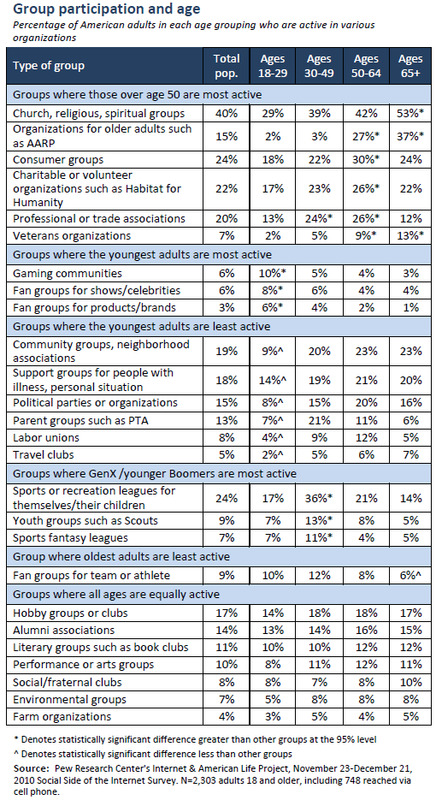 At the same time, men are more likely than women to be connected to groups involving sports or sports fan activities, veterans, and gaming groups. When it comes to age cohorts, there are similarly striking differences. Older Americans are the most likely to be active in church groups, organizations for older adults like AARP, consumer groups, and charitable or volunteer organizations. The youngest adults are the most likely to be part of gaming communities and fan groups of various kinds, and the least likely to participate in neighborhood groups, support groups, political organizations, and labor unions. Those ages 30-49 are the most likely to be active in sports and recreation leagues, sports fantasy leagues, and youth-related groups. There are also some differences tied to racial and ethnic groups. African-Americans are the most likely to be active in church groups, support groups, and parent groups. 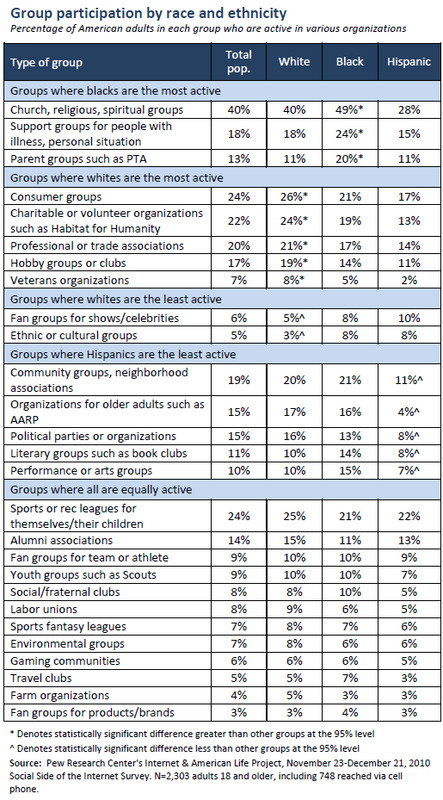 Whites are most likely to be involved in consumer groups, charitable organizations, professional or trade associations, hobby groups, and veterans organizations – and least likely to be active in fan groups or ethic clubs. Hispanics are least likely to be involved in community groups, organizations for older adults, political parties, book clubs, or performance groups. In addition to those factors, socio-economic status is strongly tied to group participation. Those with college degrees are substantially more likely than others to be participants in all the groups that were queried in this survey, except support groups, organizations for older adults, fan groups of athletes or teams, labor unions, sports fantasy leagues, gaming communities, and veterans groups. The same pattern held for household income. The higher the income the more likely someone was to be involved with most groups, except the groups cited above. Another attribute associated with being active in many organizations was the length of time a person had lived in his or her community. In a number of cases, the longer someone had lived in a community the more likely that person was to be active in certain groups, especially those that had a geographic component to them. For instance, those who had lived in a community for 20 or more years were more likely that those who had lived in a community five years or less to be active in these kinds of groups: church and spiritual groups, organizations for older Americans, veterans organizations, labor unions, and farm organizations. In some instances, the type of community in which respondents lived was tied to the likelihood of their involvement with certain kinds of groups. For example, suburban dwellers were more likely than others to be active in sports leagues for themselves or their children, consumer groups, professional or trade associations, community associations, hobby groups, political organizations, alumni associations, parent groups, sports fantasy leagues. Those who live in large cities were more likely than others to be in consumer groups, literary discussion groups, gaming communities, fan groups, and ethnic/cultural groups. Those who live in rural areas were most likely to be involved with church and spiritual groups, organizations for older adults like AARP, veterans groups, and farm organizations. Two of the main drivers of activism in groups appear to be people’s sense of their own ability to make a difference and their sense of trust in others. We did not probe either issue in great depth in this survey, but we did take simple readings. On the issue of personal efficacy, we asked respondents, “Overall, how much impact do you think people like you can have in making your community a better place to live — a big impact, a moderate impact, a small impact, or no impact at all?” Some 30% said they felt they can have a big impact; 39% said they can have a moderate impact; 22% said they have a small impact; and 10% said they felt they have no impact. In both the case of personal efficacy and the case of trust, those who felt they could have a big impact and those who thought most others could be trusted were more likely to be active in groups, more likely to be connected to multiple groups, more likely to spend more time in volunteer and group activities, and more likely to report positive personal and societal outcomes from their group experiences. Technology users were more likely to say they trusted others: 49% of internet users said that, compared with 27% of non-internet users; 49% of those who connect to the internet wirelessly said others could be trusted, compared with 28% of those who do not connect wirelessly. And technology users were more likely to say they felt they could have a big impact on their communities: 33% of internet users said that, compared with 21% of non-users; 36% of wireless internet users said they could have big impact, compared with 23% of those who do not connect to the internet that way. Clearly, a personal sense that one can have impact will likely propel some people into group activities aimed at personal fulfillment and civic engagement. In addition, the degree to which people are interested in others, can work with others, and can find benefits in social connection could also influence their willingness to become active in groups. A quarter of Americans do not belong to any of the kinds of groups that Pew Internet probed in this survey. 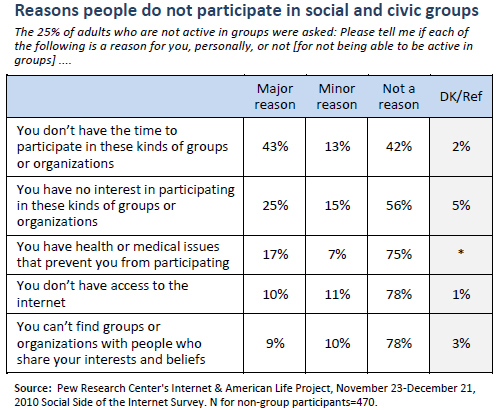 We asked those respondents some questions about the reasons they might not be active and the most frequently cited reasons were time pressures (cited by 43% of non-group members as a major reason for not being active) and lack of interest in these kinds of organizations (cited by 25% as a major reason for not being activity). Others said health issues, lack of access to the internet, and their view that they cannot find groups or organizations that share their interests. Time pressures were most likely to be cited by those under age 50 as a major reason why they were not active in groups, while health issues were most likely to be cited by those over age 50. Women were more likely than men to say that they had health issues and had difficulty finding groups that shared their interests (15% of non-group participant women cited this as a major reason vs. 4% of non-participant men). Some 20% of internet users are not active in any groups – compared with 44% of non-internet users. These internet users tend to stay away from groups because they are time stressed. Some 48% cite that as a major reason they are not active in groups. Interestingly, 17% of the non-internet users who also do not participate in groups say that lack of internet access is a major factor in their inactivity.